I must admit that I’m a breakfast girl, I need to eat as soon as I wake up otherwise I could be grumpy (and hungry). My favourite breakfasts are porridge and peanut butter toast, as they make me feel satisfied for longer and they are easy to make when I am rushing to get ready in the morning. However I am aware that not everyone enjoys eating first thing in the morning like me, so making a smoothie is a great breakfast idea. You could make it at home and quickly drink it before leaving the house or even take it with you. I was sent Almond Breeze almond milk to try and come up with an easy to make, yet incredibly scrumptious, breakfast smoothie. As I’m lactose intolerant, I usually have soya milk, so I was pleased to try an alternative dairy-free milk. 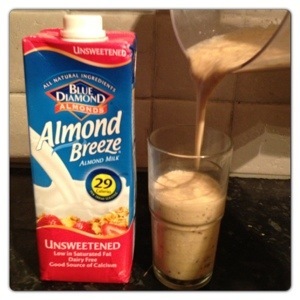 Almond Breeze almond milk is a delicious alternative that’s dairy free, lactose free and soya free. It’s made from the finest Californian almonds, so not only is it a great tasting alternative to diary milk and non dairy milk alternatives, but it’s packed with all the natural goodness of those amazing almonds. 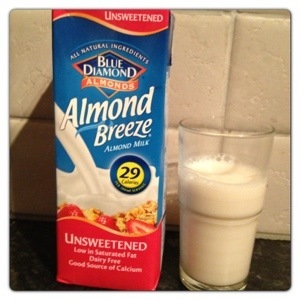 I was pleased to find out that Almond Breeze is a source of calcium and is low in saturated fat. Almond Breeze Unsweetened almond milk is free of sugars and has less than half the calories of skimmed dairy milk and half the calories of soya milk, only 29 calories per 200ml serving. So what’s my original and delicious breakfast smoothie using Almond Breeze which is definitely worth getting out of bed for? 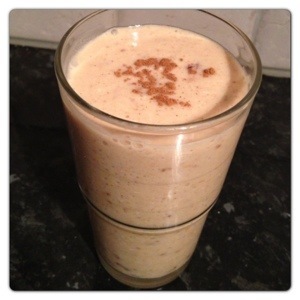 Spiced Nutty Banana Smoothie! My smoothie was created based on my two favourite breakfast, porridge and peanut butter toast, by using easily accessible ingredients found in most cupboards. You can make it in a minute, so there is no excuse to leave home without breakfast! Slice the banana and add it to a blender or food processor. 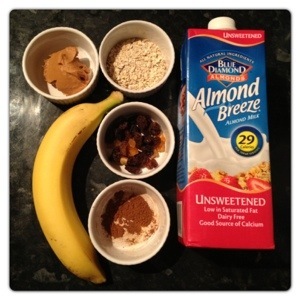 Add the peanut butter, oats, dry fruit, cinnamon and Almond Breeze milk. Whizz until smooth, pour into a glass and sprinkle cinnamon on top. Enjoy! My Spiced Nutty Banana Smoothie is quite thick, so you can add more milk if you wish until you reach your desired consistency. 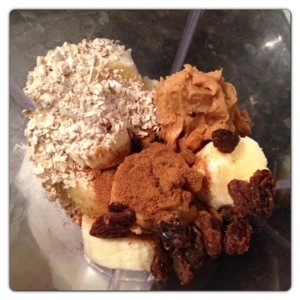 It is a very tasty and healthy smoothie, there is no sugar and it doesn’t need any as the dried fruit and the peanut butter gives it a sweet taste. The cinnamon gives the smoothie a little twist while the oats make it a perfect balanced breakfast. Besides, Spiced Nutty Banana Smoothie counts as two of your recommended 5-a-day, so it is a great way to start the day with all the vitamins and nutrients that you need for a busy day ahead! 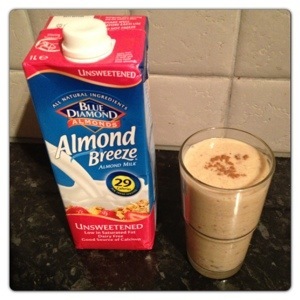 This is my entry for Foodies 100 and Almond Breeze Breakfast Smoothie Challenge. 8 Responses to "Breakfast with Almond Breeze: Spiced Nutty Banana Smoothie Recipe"
Just tried this smoothie for the first time today and OH MY GOSH, fantastic! 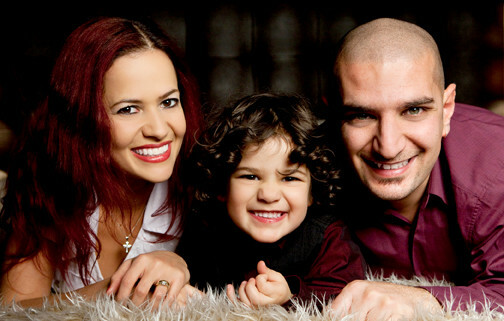 Thank you so much for sharing it with us! mmm a little rum added for the grown ups would be a nice drink too! !